Last week, the Nobel Prize website released a video of an interview with Alice Munro, winner of the 2013 Nobel Prize in Literature. Being 82 years old, she was too frail to make the trip to Stockholm to accept the prize, but this video was a great way to learn more about this amazing Canadian writer. 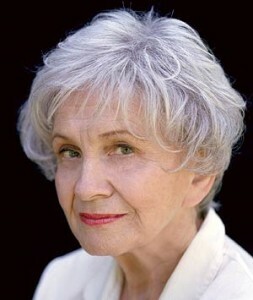 For those of you who are not familiar with her work, Alice Munro writes short stories about women and small town living. In the interview, the author said that she started making up stories when she was a child. Someone read her The Little Mermaid by Hans Christian Andersen, and the ending was so sad that Alice Munro wanted to change it. Later on, she made up stories on her long walk to school. Her early tales always had happy endings, but when she was a teenager, she started reading books like Wuthering Heights by Emily Bronte, and she saw that dark and tragic stories could also be beautiful. Then Alice Munro got married to her first husband who was very supportive of her. She didn’t say to anybody that she wanted to be a writer though, as she felt people would not understand. She was a housewife, raising her daughters, and writing whenever she could.She never thought she would win the Nobel prize, as most authors underestimate their work. In fact, she doesn’t consider having a gift because writing is hard work. Unfortunately, Alice Munro decided to give up writing about a year ago. She will be sorely missed but we are so grateful for all the books she has published during her very productive life.